By Dimitris Staikos (aka BruteForce). Common Sense is a relative thing. Everybody has his own interpretation of what Common Sense is. Considering myself a Common Man, I write about how I perceive things pertaining to Common Sense. The web server used by Commonsense4commonpeople.net is run by CloudFlare and is located in San Jose, USA. There are many websites run by this web server. The operator uses this server for many hosting clients. In total there are at least 280 websites on this server. The language of these websites is mostly english. 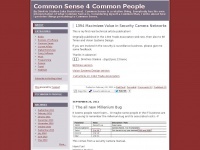 A Nginx server hosts the websites of Commonsense4commonpeople.net. XHTML 1.0 Transitional is used as markup language on the webpages. To analyze the visitors, the websites uses the analysis software Quantcast. The website does not specify details about the inclusion of its content in search engines. For this reason the content will be included by search engines.